The news relative to Amazon’s ultimate selection of two separate U.S. cities for its second (HQ2) corporate headquarters may have overshadowed a third significant announcement for the supply chain management logistics and technology communities. That announcement was the planned $230 million investment in the establishment of an “Operations Center of Excellence” in Nashville Tennessee. According to reports, the planned new one million square foot site will be located the Nashville Yards section of the city and could bring up to 5000 “well paying” jobs. Nashville was reportedly one of the cities under consideration for HQ2 selection, thus some might speculate that this was a consolation move. Not so from our Supply Chain Matters lens. An Amazon executive indicated to a local new outlet that it made a lot of sense for the online retailer to consider an Eastern U.S. regional hub for the firm’s operations teams. The new site will reportedly have responsibility for customer fulfillment, transportation and other supply chain related activities. It will further include operations and technology development focused positions with salary levels expected to average $150,000. As was the final selection of the two announced HQ2 sites, Arlington Virginia and New York City, Amazon will receive upwards of $102 million in local and state incentives over the coming seven years based on creating the 5000 planned jobs. Incentives were related to planned capital investments, public transportation expansion and state/municipal tax credits. Nashville is within a few hours driving distance from the Cincinnati/Northern Kentucky Airport (CVG) which serves as a key operations hub for Amazon Prime Air, the retailer’s contracted air freight transportation entity. Leased tractor-trailer rigs can reach 11 Eastern U.S. customer logistics and fulfillment centers, also in a few hours of drive time. In 2017, Amazon announced a $1.5 billion additional investment in this massive airfreight hub, and earlier this year, announced plans to acquire an additional 210 acres of land adjacent to the airport. CVG is not only recognized as one of the fastest growing air cargo airports in North America, but when the full plans of expansion are completed, could rival the size of either the FedEx Memphis or UPS Lexington Kentucky air hubs. As Supply Chain Matters as noted in prior commentary, before initiating its own parcel logistics capabilities, the online retailer conducted rigorous studies of then existing FedEx and UPS air hub and spoke networks, taking note of design and logistics bottlenecks. 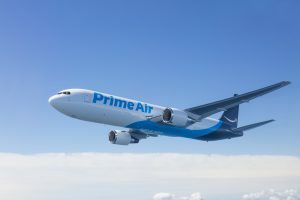 As a consequence, Amazon’s air movements are timed to depart International or U.S. West Coast airports far later, gathering latest order fulfillment needs, while ferrying air cargo directly to CVG and quickly fanning outward to Eastern U.S. fulfillment centers. In addition, sored inventory is better planned for regional or local city stocking needs. In essence the design was to best existing logistics and last mile customer fulfillment capabilities. Amazon’s recent announcement of a significant expansion in independent contractor branded delivery van capabilities is a further component. Nashville is further in close proximity to many noted universities with recognized supply chain management business process and information technology research programs such as the University of Tennessee, Penn State, Ohio State University, Georgia Tech, and the University of Alabama. Thus, we view the Nashville Center of Operations Excellence as being a further extension for tapping U.S. Eastern regional-based process, logistics networks and technical development talent to add more innovation in online customer fulfillment. That would likely include advanced robotics, autonomous driving, Internet of Things (IoT) and eventually blockchain enabled technologies. Thus, while general media can well focus on a perceived sham orchestration of the eventual HQ2 selections, our community should focus on the Nashville site selection and what transpires over the coming months.